The 2009 Automobile Executive of the Year award luncheon at the Detroit Athletic Club this month will be a homecoming for the honoree. 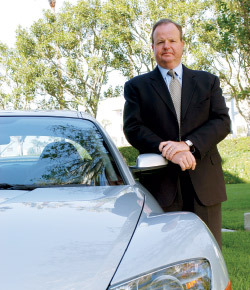 Jim O’Sullivan, president and CEO of Mazda North American Operations, was Detroit born (1953), reared (Rosedale Park), and schooled (Benedictine High and University of Detroit — both bachelor’s and master’s). Along the way, he drove a truck at Winkelman’s warehouse and lugged cement bags at Medusa. But he was destined for the auto industry. In 1976, fresh out of college, he started at Ford Finance, then migrated to sales and marketing. After stints in advertising, regional operations, and retail-sales management, he became a Lincoln-Mercury senior marketing executive before joining Mazda North America as president and CEO in 2003. How often do you get back to Detroit? About once a quarter. I pick up a pizza at Buddy’s and visit my 93-year-old mother in Birmingham. That’s my idea of dining. I usually stay in Dearborn, which gives me access to Ford and Flat Rock. I also enjoy going to Tribute [and] Beau Jack’s. What do you miss about Michigan? Growing up on Grand River in Detroit, I used to catch the bus or hitchhike to Olympia. Hockey Night in Canada was my favorite show on Saturday night, in black and white. And I miss friends and family. I’m one of eight kids, and six of my brothers and sisters still live in the area. And the city itself. It’s going to get through this tough patch and come out a lot stronger. Are your kids into cars? Yes, they are. I have four: Clare, who is 27 and just got married; Patrick, 24; Michael, just turning 21; and Colleen, 17. All of them are passionate about automobiles. What’s your outlook for the U.S. auto industry? 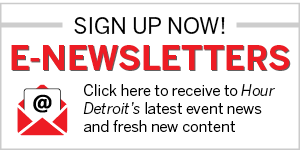 Detroit will continue to have a very significant presence. We’ll see some brands that will not be in the marketplace in years to come, but Detroit and the domestic industry will definitely be around for another 100 years. On May 6, O’Sullivan will come home for the invitation-only luncheon and the honor bestowed by North American Automotive Services. He was selected, says the organization’s Robert Djorovic, for his “innovation, market expertise, and dynamic leadership.” Previous honorees include Henry Ford II, Lee Iacocca, Jim Press, Rick Wagoner, and Dieter Zetsche. The nominating committee is composed of auto industry media, analysts, and supplier CEOs. I’m very pleased to accept it, but personally humbled, because it’s really a team award for a team effort, for all the hard work done by everyone here at Mazda North America, at our parent company in Hiroshima, our dealer body, our suppliers, and our plant in Flat Rock. What’s been key to Mazda’s comeback from near-bankruptcy in the 1990s? One thing we focused on was getting back to “Zoom-Zoom, the Soul of a Sports Car,” in everything we do. It took a lot of discipline; there was pressure to do a full-size pickup, for example. But one thing we learned from the ’90s was to stay focused on who we are and who we want to be and not try to be all things to all people, so we did not go down that path. This business is a marathon that never ends, not a 100-yard dash. About six years ago, we had probably the weakest distribution network in the U.S. in terms of how we were represented in showrooms. We had almost 900 dealers, and just 19 percent were exclusive. That meant 81 percent were shared [with one or more other brands], so we were not necessarily represented well. Today, we have about 650 good, dedicated dealers, 51-percent exclusive, to carry us through these tough times. Another very important thing that is paying dividends today is our new relationship, effective last Oct. 1, with Chase Financial Services. They’re buying paper and financing our products, and we’re still very much in the leasing business and into APR programs. They now do all our leasing programs, and they’re working with our dealers on moving all our wholesale floor plan line from Ford Motor Credit over to them. That has provided us liquidity. Another is getting the right people in key positions and stability of our management team, having people who are very focused and passionate about automobiles and this brand has been very critical in good times and bad. Still another is keeping things relatively lean. When we saw the softening toward the latter half of last year, we took immediate action to cut production, keep our inventory lean and get our dealers’ days supply down. We don’t have a lot of unsold cars out there. How can automakers survive and prosper in such difficult times? Understand your strengths and capitalize on them. Also know what your weaknesses are. You have to be brutally candid within your organization about the business and the things you can and can’t do. Everyone is taking cost out, and we’ve been absolutely ruthless about that over many years. But at the same time, we’re launching new products, and staying focused on products that differentiate us from our competition. We’re continuing to focus on driving dynamics, styling, and value for money — our cores for the last several years. What are your relationships with Ford and with Mazda in Japan? Our relationship with Ford is very strong. Ford now controls 13.4 percent of the outstanding shares of Mazda, down from 33.4 percent. They did that transition in October, which helped them with liquidity. But Ford is still the largest shareholder, and there’s still a strong synergy between the companies. We still have 50-50 ownership of the plant in Flat Rock, and our joint product development programs continue to move forward. The level of cooperation and our relationship with Mazda in Japan are very tight. Another thing that I feel very honored about, and it’s a reflection on the team, is that I’m also a managing executive officer of the parent corporation in Japan, which has not been normal practice in the past. That tells you the importance of the North American market and of the role we play in decisions made by the senior management of the company. How much influence do you have on North American market products? Quite a bit. We have a fairly significant presence here, with an R&D Center and a Design Center that has taken the lead on specific programs. CX-7 and CX-9, for example, were specifically designed, engineered, and developed for the North American market. That was us going to the table and saying, they have to fit “Zoom-Zoom,” and they have to fit North America. We don’t have final say, but we have very major input into cycle planning, design, and calibration … how the cars drive and handle and the powertrains that go into them. Did you have a mentor at Ford? When I started at Ford, I worked for Ed Lundy, one of the original “whiz kids.” He was executive VP of Finance, and he taught me the numbers piece of it. Another was Ross Roberts, who ran Ford Division for a number of years. He taught me the importance of relationships and honesty and working with not only internal stakeholders but also the dealer body. Not just salesmanship but developing long-term, trusting relationships. Leadership comes down to motivating people and working with them as a team to get things accomplished. First and foremost is integrity. That’s something you earn over time, and it’s very easy to lose. If people trust and believe in you, you can get a lot of things done. Integrity also comes back to dependability, staying focused on things that are necessary, making decisions and moving forward with them, even during tough times. And getting through very difficult times is a matter of getting focused on the fundamentals, on what we can control, keeping a positive attitude, and developing trust and honesty with everyone in the organization, including our dealers and suppliers.